Prince Nicholas Borissovich - His journeys abroad - His marriage - Arkhangelskoye - Prince Boris Nicholaievich. PRINCE Nicholas is one of the most striking of my ancestors. Gifted with a remarkable personality, keenly intelligent and very erudite, he was a great traveler, spoke five languages, and corresponded with most of the famous men of his day. In addition to this he was a great patron of the arts, as well as the friend and counselor of Catherine the Great and her successors the Tsars Paul I, Alexander I, and Nicholas I. 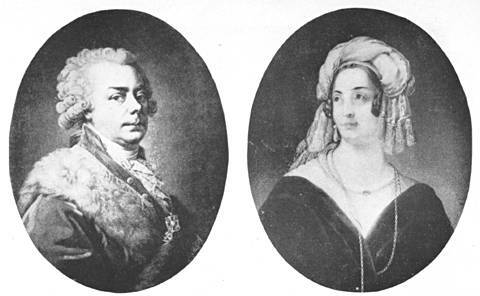 Above left: Nicholas Yussupov (1751-1831) | Above right: Pricess Tatiana Yussupov (1769-1841) She wears the Peregrina pearl in her ear. When be was seven, his name was put down for one of the Imperial Guards regiments, and he received a commission at sixteen. Later, he reached the highest dignities of state and was given all the most coveted decorations of his time, even the diamond and pearl shoulder ornament usually reserved for members of reigning families. In 1798 he was Grand Commander of the Orders of Malta and of St. John of Jerusalem. It has even been asserted that be received other more intimate if less dazzling favors from Catherine the Great. Prince Nicholas spent a considerable part of his life abroad. There he met the greatest artists of his day, and remained in correspondence with them when he returned to Russia. When be went to stay in Paris, Prince Nicholas was often invited to receptions given at the Palace of Versailles and at the Trianon. Louis XVI and Marie Antoinette were very fond of him and presented him with a Sevres dinner service with a floral design on a dark brown ground, one of the finest specimens produced by the Royal Manufactory, and originally intended for the Dauphin. No one had any idea what had become of this service, till in 1912 I was visited by two French professors who were making a study of Sevres porcelain. This led me to make investigations, and in a far corner of one of our furniture warehouses, where it bad been stored for more than a century, I found the Sevres service presented to my great-great-grandfather by Louis XVI. Prince Nicholas prided himself on his friendship with Frederick the Great of Prussia and with the Emperor Joseph II of Austria. He was also a friend of Voltaire, Diderot, d'Alembert and Beaumarchais; the last-mentioned composed an ode in his honor. In 1795, Prince Nicholas married Tatiana Engelhardt, one of Prince Potemkin's five nieces. Tatiana was a charmer from early childhood. When she was twelve, the Empress Catherine took the child under her wing and kept her beside her constantly. Princess Tatiana soon conquered all hearts at court and, as she grew to womanhood, had numerous suitors. At that time an Englishwoman, as famous for her beauty as for her eccentricity, came to St. Petersburg. She was the Duchess of Kingston, sometimes known as the Countess of Bristol. On the bridge of her luxuriously decorated and appointed yacht, she had arranged an exotic garden stocked with rare birds. The Duchess of Kingston took a great fancy to Tatiana. The day before she left Russia, the Duchess asked leave of the Empress to take her protegee back to England with her, promising to make her sole heiress to her immense fortune. Catherine told Tatiana about this proposal, but, although she was much attached to the Duchess, Tatiana refused to leave her country and her empress. She was twenty-four when she married Prince Nicholas Yussupov, who was over forty. At first their marriage was a very happy one, and a son named Boris was born to them. In St. Petersburg, in Moscow and at Arkhangelskoye, their summer residence, the couple were always surrounded by artists, poets and musicians. Alexander Pushkin was one of their intimate friends. The poet spent part of his youth in a suite of rooms which the Prince and Princess had given his parents in their Moscow house. Princess Tatiana was not only a perfect hostess, as gracious as she was witty, but also proved to be an excellent business woman. Under her wise administration her husband's fortune increased, while the standard of living of the peasants on the Yussupov estates was much improved. She was gentle and kindly. "When God tries us," she used to say, "it is for the sole purpose of enabling us to exercise our faith and patience." Notwithstanding her many virtues she loved beautiful clothes. She was particularly fond of jewelry, and her collection became the nucleus of a larger one which was to become famous. She bought a diamond called the "Polar Star," several sets of jewels which came from the French Crown, the jewels of the Queen of Naples and, lastly, the unique and splendid "Peregrina," a celebrated pearl which had belonged to Philip 11 of Spain and, in ancient times, or so tradition has it, to Cleopatra. The Prince, who loved his wife after his own fashion, gave her an unlimited amount of money to spend. His peculiar nature showed even in his gifts. On one of her birthdays he gave his wife all the statues and stone urns which adorned the park at Arkhangelskoye; on another occasion, he made her a present of animals and birds to stock the zoological gardens which she had planned and created on the estate. But their happy relations did not last. In his old age Prince Nicholas turned into a profligate. The Princess, wishing to leave a place where her husband lived like a pasha in the midst of his seraglio, retired to a small pavilion, called "Caprice," which she had built in the park of Arkhangelskoye. Renouncing the world and its pomp, she gave herself up to her son's education and to good works. She survived her husband by ten years and died in 1841 at the age of seventy two, having kept to the last the rare qualities which had made her famous. After years spent in traveling through Europe and the Near East, Prince Nicholas returned to Russia and applied himself diligently to furthering the fine arts. He began the installation of the Hermitage Museum and of his own picture gallery at Arkhangelskoye, which he had recently acquired. He built a theater in the park of the estate where his private company of actors, his musicians and his own ballet dancers, gave performances that were long remembered in Moscow. Arkhangelskoye became an art center that attracted foreigners as well as Russians. It was then that Catherine the Great, who appreciated Prince Nicholas' taste and ability, gave him the management of all the imperial theaters. 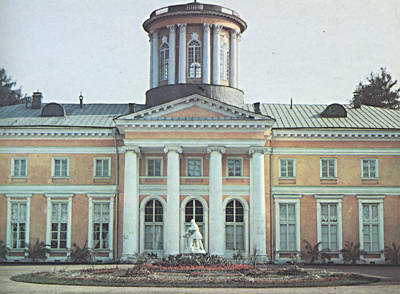 Two factories, one for porcelain, the other for glass, were built by the Prince on his estate of Arkhangelskoye. He sent to the Sevres manufactory for decorators, workmen and raw materials, and kept the entire output for his private use, chiefly to give as presents to friends and distinguished visitors. Porcelain with the trade-mark "Arkhangelskoye 1828-1830" is much sought after nowadays by collectors. Unfortunately fire destroyed the factory and warehouses and a great quantity of Arkhangelskole porcelain was lost as well as a magnificent "rose du Barry" service of Sevres, bought by the Prince on one of his journeys to Paris. In 1799, Prince Nicholas returned to Italy where he spent several years as ambassador to the courts of Sardinia, Rome, Naples and Sicily. During his last stay in Paris, in 1804 he often met Napoleon I. He had the entree to the Imperial box in every Parisian theater. When he was about to leave France, the Prince was presented by the Emperor of the French with two large Sevres vases and three tapestries representing Meleager's Hunt. An Eastern prince who was making a short stay in Moscow having expressed the desire to visit Arkhangelskoye, Prince Nicholas had a wall built in front of the chapel in order to conceal it from his visitor, for he could not bear the idea that an infidel migbt enter it. The wall is curiously topped with small pinnacles of Oriental design and was, so they say, erected in two days by the Prince's serfs. His head steward was a Frenchman called Deroussy. He humored all his master's imperious whims, but his cruelty to the peasants made them hate him. One fine evening they burled him from the top of a tower and threw his body into the river. The culprits were arrested, each received fifteen lashes with the knout, their nostrils were torn off, the word "murderer" was branded on their faces with a red-hot iron; after which they were sent to Siberia in chains. A great number of gardeners were needed for the upkeep of the park. Prince Nicholas, who wished Arkhangelskoye to be a residence dedicated solely to luxury and beauty, forbade the cultivation of cereals on his land. He bought wheat from a neighboring estate for his peasants' needs, and the latter were employed only in maintaining and improving his gardens. The park was laid out in the purest French style. Three long terraces adorned with statues and marble urns led down to the river. In the center, long hornbeam hedges bordered a sweeping lawn, and fountains played on every side, Four pavilions stood on the river bank, connected by hothouses over two hundred yards long. In the winter garden among the orange and palm trees were seats and marble fountains. Exotic birds and flowers gave the illusion of eternal summer, even while, from the tall casement windows, one saw the park lying shrouded in snow. The Prince's zoological gardens were stocked with specimens of rare animals which he had brought from foreign countries. Catherine the Great presented him with a whole family of Tibetan camels, and while these animals were on their way from Tsarskoe Selo a special courier rode each day to Arkhangelskoye to keep the Prince informed of their state of health. Tradition has it that every day, on the last stroke of noon, an eagle flew from the park to the chateau, and that the fish in the ponds had gold rings in their gills. In 1812 Prince Nicholas was obliged to leave Arkhangelskoye and take refuge at Tourachkin where the Russian armies bad fallen back before the advancing French troops. For long months he was without news of his estates. When the war ended, he returned to Moscow to find his house intact, but Arkhangelskoye seriously damaged. All the statues in the park were mutilated and the trees uprooted. On discovering that the noses of his mythological deities had all been broken, the prince exclaimed: "Those pigs of Frenchmen have given my entire Olympus syphilis!" In the chateau itself, all the doors and windows had been taken away, and most of the furniture and objets d'art lay in heaps on the floor. The destruction of his beloved collection proved too much for the Prince, and he took to his bed. "Here is the latest news from Moscow: the magnificent cbateau of Arkhangelskoye has been burned down, and this misfortune is due to the old prince's avarice, for he insisted on using sawdust instead of wood to beat his stoves, There is, alas, but a step from sawdust to ashes. The greater part of the library and many pictures have been destroyed. To save them from the flames, paintings and objets d'art were thrown out of the windows. As a result, the arms and feet of Canova's celebrated group, Love and Psyche, were broken. Poor Yussupov! How could he be so stupid? I think that Arkhangelskoye will never forgive him its gaping wounds, to say nothing of its desecration by a whole harem of dancers and prostitutes." All Moscow gossiped about the scandalous life led by old Yussupov. Separated from his wife for many years, he kept an incredible number of mistresses, dancers and peasant girls. An habitue of the Arkhangelskoye theater used to relate that when the whole ballet was on the stage the Prince waved his cane and suddenly all the dancers appeared completely naked. The premiere danseuse was his favorite, and he showered on her magnificent gifts, but his great passion was for a very beautiful Frenchwoman who unfortunately drank. She led him a terrible dance, and when she was intoxicated their quarrels often degenerated into a battle royal. China and ornaments were smashed to pieces, and the wretched Prince lived in a state of continual terror; nothing could soothe his irascible mistress but the promise of some splendid gift. His last intrigue was with a girl of eighteen. He was then eighty. The Prince's journeys were complicated affairs. He never traveled without his intimate friends, his mistresses of the moment, a numerous staff of servants, his musicians and their instruments, not to mention his favorite dogs, monkeys, parrots and part of his library. Preparations lasted for weeks, and at least ten coaches, each drawn by six horses, were required to convey the Prince and his retinue. He never omitted to have a salute fired from his own guns whenever he left Moscow for his summer residence and upon his arrival at his destination. Prince Nicholas died in 1831, aged eighty. He was buried on his estate of Spaskole-Sclo, near Moscow. I cannot end this short biography of my great-greatgrandfather without devoting a few lines to the estate which was his masterpiece. "Arkhangelskoye," he used to say, "is not run for profit, but is a source of expense and joy." I have known more magnificent and imposing places, visited many a royal or princely residence, but nowhere have I seen a house as finely proportioned as Arkhangelskoye. And nowhere have I found man's handiwork so happily united with that of nature. The names of the architects who actually built this masterpiece are unknown. Arkhangelskoye first belonged to a Prince Galitzin who began the construction of the chateau but, having lost a great deal of money, was obliged to part with it and sold it to Prince Yussupov. The latter continued the building of the house but made important changes in the original plans. These had been drawn up by the French architect Guerne, but as he never came to Russia himself his ideas were doubtless carried out by Russian architects. In all probability, when Prince Nicholas became the owner of Arkhangelskoye be himself superintended the work of construction with the aid of an Italian, Pietro Gonzago, a wellknown architect and stage decorator of the period. Prince Nicholas often asked him to his house at St. Petersburg, and also commissioned him to paint scenery for his private theater. It is more than probable that the Italian artist helped in the decoration of Arkhangelskoye. A detailed description is necessary in order to give an idea of the house. I will describe it, just as I knew it. A long, straight avenue led through a forest of pine trees to a circular courtyard round which ran a colonnade. On the ground floor of the chateau, great columned halls with frescoed ceilings were adorned with statues and fine pictures. Two rooms were specially reserved for the works of Tiepolo and Hubert Robert. In spite of their imposing proportions, all these rooms were friendly and intimate, thanks to the beautiful old furniture and a profusion of plants and flowers. A rotunda intended for receptions had doors opening onto the park. All the visitors who came to Arkhangelskoye admired the view from this room; terraces and a long green lawn lined with statues stretched to the horizon and seemed to fade into the shadowy blue of the forest. The left wing contained the dining room and my parents' private rooms. On the floor above were my rooms, my brother's and the guest rooms. In the right wing were the reception rooms and a library of thirty-five thousand volumes, among which were five hundred Elzevir editions and a Bible dating from 1462. All these volumes were in their original bindings, with this bookplate: "Ex biblioteca Arkhangelina." In my childhood I was afraid to wander around the library, for it contained a life-sized automaton representing jean Jacques Rousseau, dressed in an eighteenth-century French costume; the figure was seated at a table, and a spring would put it in motion. Near by was a collection of ancient carriages. I particularly remember a wooden coach, carved, gilded, and decorated with panels painted by Boucher. On raising a cushion of the back seat, a closet stool was disclosed. Prince Nicholas, who bad been obliged to attend the Tsar Paul Is coronation in spite of illness, had had this facility built into his state coach. In 1912 when I modernized the private apartments of the chatcau, I had to be on the spot to superintend the work. I took advantage of this to look through the storerooms, the basement and the attics and discovered some wonderful treasures. I found a great roll of dusty canvases which turned out to be the stage scenery painted by Pietro Gonzago. I bad these placed in the theater where they were most effective. I also found whole crates full of crystal and porcelain from the Arkhangelskoye factory. I took this treasure trove to St. Petersburg where it adorned the cabinets in my dining room. After the death of Prince Nicholas, Arkhangelskoye went to his son, Prince Boris. He was far from possessing his father's personality and had quite a different nature. His independence, integrity and great frankness brought him more enemies than friends. Neither rank nor fortune played any part in his choice of friends; all that mattered to him was their worth and honesty. On one occasion, when he was about to entertain the Tsar and Tsarina, the court minister struck out several names on the list of guests. The Prince refused to accept this. "When I have the great honor of receiving my Emperor," lie said, "all my friends should be considered fit to share it." During the famine of 1854 Prince Boris made himself responsible for the maintenance of his peasants. Naturally be was adored by them. He took great pains with the administration of the fabulous fortune he had inherited. Prince Nicholas had long hesitated whether he should leave Arkhangelskoye to his son or to the state. He realized that if ever it belonged to Prince Boris the whole character of the place would be altered. And sure enough, no sooner was the old Prince dead than his son at once turned Arkhangelskoye into a profit-making concern. Most of the works of art were removed to St. Petersburg, the animals from the zoological gardens were sold, actors, dancers and musicians dismissed. The Emperor Nicholas tried to intervene, but it was too late; irreparable harm bad been done. when Prince Boris died, his widow inherited his whole fortune. He had married Zenaide Ivanovna Narishkin, who later became Comtesse de Chauveau. Their only son, Prince Nicholas, was my mother's father.